Package combining the Caspian M2 power amplifier and integrated amplifier, which can be used as a pre-amp using the pre-out. Roksan Caspian M2 Integrated + Power Amplifier Package gives you the stunning performance capabilities of the Caspian M2 series at a more affordable pricepoint for an unbeatable combination. Roksan Caspian M2 Integrated Amplifier is one of the best integrated amplifiers available, combining power with finesse and musicality, and advancing the performance of integrated amplifiers to an entirely new level. It has won Best Integrated Amplifier for four years running! 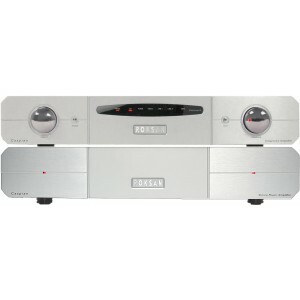 Roksan Caspian M2 power amplifier is a power upgrade for the Roksan Caspian M2 integrated amplifier or to use with any other pre amplifier or integrated amplifier and/or with the Roksan Caspian M2 CD player. For more information, please visit our main Caspian M2 Integrated page. For more information, please visit our main Caspian M2 Power page.